It took me a long time to develop a putting routine. Many years, in fact. Turns out, there was a lot to know! Here’s what I’ve found out, and what works for me. This article, in fact, was a precursor to my book, Comprehensive Keys to the Green. The major factors in preparation are reading the slope of green, knowing how much the slope will affect the putt, understanding the effect of grain, and gauging distance. The trick to reading greens is to find the fall line — especially near the cup. If you’re familiar with skiing, you’ll know that the fall line is the direction things travel, when going downhill. It’s what happens to an object that is free to slide or roll, under the influence of gravity. Look at the edges of the green. As you look around, you’ll see areas that are higher, and some that are lower. Most are designed so that water runs off, rather than sitting on the green. So look for the area that water will run to. When you’re standing downhill from a hole, the back of the hole will be higher than the front. (It will be higher in other positions, as well, due to your perspective. But it won’t be as high as when you’re standing directly downhill.) That’s one way to find the fall line. Also, from directly below the hole, you’ll see a symetrical crescent shape made by the back of the cup. If you move to one side, the crescent gets a bit lop-sided. The symettry tells you when you are standing on the fall line. Move around and feel the ground under your feet. If you pay attention, you’ll notice that you can feel the ground sloping under your feet. Watch what happens to other putts. Pay particular attention to what happens near the hole, and to the very last motion, just before the ball stops. At that point, the ball is traveling its slowest, and pretty much the only force on it is the break. (Of course, your playing partners rarely cooperate. Either the ball stops well short of the hole, or it scuttles well past, powering through the break. But every once in a while, a ball comes to rest somewhere near the hole. That is a perfect time to read the break. In my games, I look around and find the slope. Then I get below the hole, as close to the fall line as I can see. Then I watch other putts to confirm my read. A “fast putt” is a downhill putt, or a putt on a smooth, close-cropped green. A “slow putt” is an uphill putt, or a putt on a bumpy, lumpy, or “furry” green. A “bumpy” green is one that has been “plugged” for aeration, so there are lots of little holes filled with a mixture of sand and grass seed. A “lumpy” green — is one that hasn’t been cared for well, or one that has been so soft that every passing foot leaves a lasting mark, and every ball landing on the green leaves a dimple. Gary McCord tells a funny story. He was out West, and played a putt that had a 5″ break. He stroked it, and watched it move 5″ the other way — uphill. He asked his caddy what the heck happened. His caddy replied, “Grain”. He said he quite playing right at that moment! If you can pace off exact yards, that’s great. Multiply by 3, and you have feet. Even if you’re not exact, pacing gives you a measurement that is accurate enough for golf work. It’s amazing, but you can get a lot of information just by looking at the cup. something I figured out while shooting hoops as a teenager: A circle looks like an oval from a distance. The farther away you are, the flatter the oval. So just by looking at the cup, you can get a feel for distance, as well as a feel for the break near the hole (the most important break, because the ball will be traveling slowest at that point). The combination of pacing and consciously looking is particularly helpful. After pacing off a putt, look at the cup and mentally register it’s appearance. Over time, you’ll get better at seeing the hole and knowing your distance without even having to pace to off. The shape of the hole is also affected by the slope. From the same distance, the oval is flatter when you’re uphill, more circular when you’re uphill. So the shape of the hole you see can also help you find the fall line! It’s important to have a routine. But it’s also important for the routine to make sense. That’s why it took me so long to come up with this one — every step in it plays a part in a making a successful putt. I think it was Dream On–the story of one golfer’s journey to par — that made an important observation: Scratch handicappers have an absolutely consistent routine. Their routine on the tee will differ from their routine on the green, of course. But in any given situation, they set up and execute every shot in exactly the same way. That kind of consistent prepration helps to create consistent results. How far is the putt? Is it a fast green, or a slow one? Very fast or very slow? How much slope is there? None? A little? A lot? What about the grain? As you move to your body, consciously catalog the conditions: Speed of greens, amount of slope, and grain. Again, just make a mental note of them, and pick your line accordingly. Your mental computer will continuously improve your adjustments, over time. Place the aiming stripe in the general direction of the line you plan to putt. Get a read from behind the ball. Step back and squat to get a good angle. Get a nice, low read on the hole, paying most attention to the last third. See if you lined up your ball directly on the line you see now. If the alignment line is a little left or right, take that into account when you address the ball. (Don’t bother changing the position of the ball. Just line up a little one way or the other.). Get ready to address the ball. I’ve seen people do that, while contorting themselves to keep their right hand on the club in their normal grip. That looks really awkward, to me. I use the plam of my hand to steady the club as I move around it. My fingers are draped loosely around the grip, but they don’t need to be. The palm of my hand is doing the work. That keeps my hand relaxed as I prepare to putt, making it easier to take the nice, soft grip that is recommended. Address the ball and forward press. Keeping your putter in position, move around to the side and place your feet. (The ball will between somewhere between your left heel and the middle of your stance, depending on your preference.) 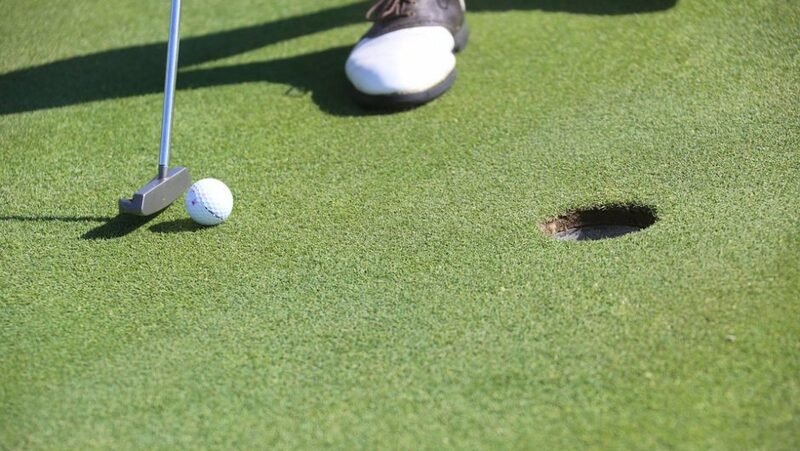 When your feet are in place, flick the putter to square. (That “flick” is a trigger that zeroes in my concentration. )In the forward press, you move your hands slightly ahead of the putter face. That takes the loft out of the putter, so you the ball rolls the whole way, rather than bouncing. (Dave Stockton likes to use it as his trigger, when he’s actually putting the ball. See the line to the hole and rock on your feet. With your eyes on the hole, visualize the line of the putt, and rock from side to side, lifting and adjust your feet ever so slightly. Standing to the ball, you’re closer to the hole, and you have a different angle. You’ll see break you hadn’t noticed before, and you’ll feel break under feet you weren’t aware of before. (Your toes won’t be on the same level as your toes, and your kinesthetic sensation — or body awareness — will be aware of that. )As you rock your body, don’t worry about consciously adjusting your feet. Just focus on the hole, visualizing the putt. Your body will do the rest automatically. Your feet will be placing themselves in the best possible position, and your mental computer will be calculating the force you need to put on the ball. Put your attention back on the ball. Pull the putter back, and swing through. That’s another thing I agree on with Dave Stockton. If I’m going to throw you a ball, I don’t take a practice swing first. I know where you are, and I can feel the weight of the ball in my hand. It’s not a conscious thought process. It’s a skill acquired over the years. I just toss it to you. Same thing with putting. Distance control is about getting a sense of the speed of the greens and the amount of speed imparted by a given swing. Besides, If I take a practice swing, it’s likely to be my best effort! Why waste it? A terrific, inspiring chronicle of one golfer’s journey, starting from 100, to a par round in a year.